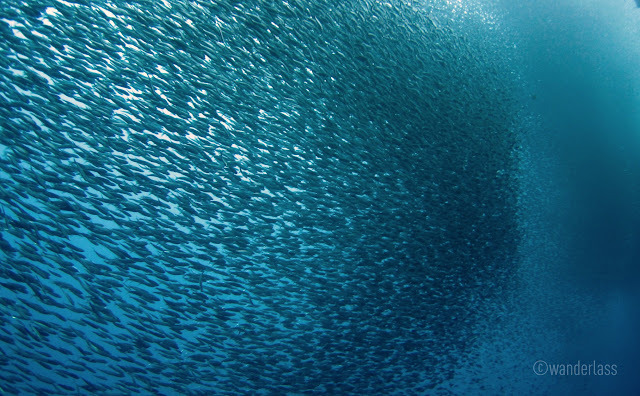 We have our own Sardine Run in the Philippines! my friend Beth twitted me during the time I was obsessing about the Sardine Run in South Africa–after seeing it in BBC. And so my obsession shifted. It’s obviously easier to attain this one. Around May 2010, a youtube video of a thresher shark preying on the billions of sardines in Pescador Island began circulating in facebook. A few days later, there were news on whale shark sighting on the same site. It became the most popular topic in the local diving scene. Thousands of Manila divers flew to Cebu to witness this phenomenal gathering in Moalboal. And this went on for months. Weeks after weeks I was dying of jealousy seeing diver friends post videos and photos. Needless to say, I was itching to go myself but unfortunately many happenings kept me from pushing thru with my going there, including the time Beth, Vangie, and I dove in Malapascua. Moalboal was originally part of the itinerary but we partied too much! Family excursion has become a tradition for us. Each year my sisters and I would take our parents for vacation, once during Holy Week and another during New Year. This year we decided to go to Cebu. I wanted to experience Boracay NYE party but I was outnumbered as none of my sisters been to Cebu before. I love Cebu anyways and I made use of the opportunity to visit Moalboal. The whale shark sighting has long been gone and so was the thresher but I think the wall of sardines is still worth a visit. I’ve invited some friends to dive together, but I was fine to do the trip by myself. As the rest of my family prepare to fly back to Manila, I took a taxi from Mactan to the South Bus Station. Moalboal is 2-3 hours drive south of Cebu City. You can hire a private van (or taxi) and would cost between P2,000-2,500 ($50-62). The taxi I was on offered to drive me for 1,800($45) but I didn’t take it because it’s very expensive for 1 person. Instead I took Ceres Liner from the South Bus terminal. A seat only costs 100 pesos ($2.5) and I took 2 because of my dive bag. The bus normally takes 3 hours because of the various stops it makes. Other option would be to take a V-Hire–these are 18 seater vans. This also costs 100 pesos per seat and should be faster than a bus. But I think it will be cramped specially with big bag like me. After the bus dropped me off the terminal in Moalboal, I took a tricycle to Panagsama Beach for 70 pesos. I didn’t bargain anymore since the driver was also my porter and ride took about 20-30 minutes. I did share a van with a couple I met going back to the city. Moalboal Van for Hire: Gabrial +63.916.865.3176 owns a Toyota Hi-Ace and is very reliable driver. We paid P2,200 pesos for 1 way. Where to Stay & Dive in Moalboal? Panagsama Beach is the most popular in Moalboal so this is where you find most of the dive resorts, restaurants, and bars. I stayed at Eve’s Kiosks +6332.474.3008 because it’s beside Nelson’s scuba shop. The accommodation is basic but it’s newly renovated and clean. They have a pool, small garden, restaurant with fast wifi connection where the guests hang-out. This is where I took most of my meals and spent my non-diving time. The staff is nice and Eve is easy going. I paid P1,000 ($25) per night, this can be shared by 2 people. Like most Philippine destinations, Moalboal have accommodation budget to suit all travelers. A short walk from Eve’s is the Cabana Resort where I would like to stay the next time. It’s facing the ocean and the cottages look cozy. The Italian restaurant, Marina, has really good pasta. They told me pizza is worth a try but I wasn’t able to. The service is good but I got turned off a little when I asked for a glass of red wine, I was given one that had probably been opened for a month (pfeew!). As it claimed to be an authentic Italian place, it raised your expectation a little. Anyway, they were happy to serve me coke instead. 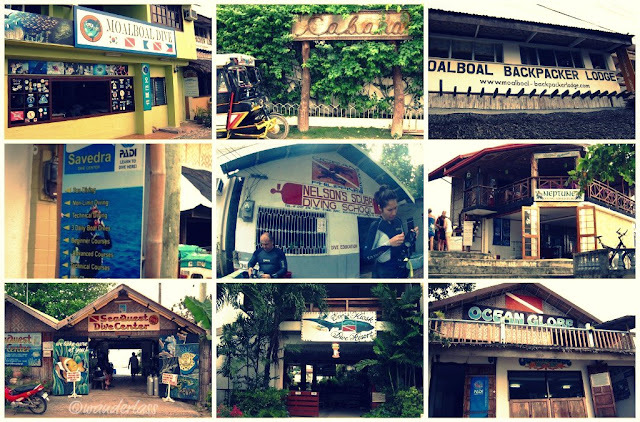 There is definitely no shortage of dive shops in Moalboal. According to Nelson of Ocean Safari Philippines (OSP) and incidentally the incumbent vice Mayor, there are 21 dive shops in this small town. I chose his shop because all my dive friends dove with him. More popularly known as Nelson Scuba Diving School +63.917.27.7969, OSP has been in operation since 1979, making it the first dive shop in Moalboal. It’s also the only Filipino owned dive shop with 100% Filipino staff. I had the chance to chat with him and he told me of the hammerhead sharks that they see everyday in the 80’s. The sardines used to be scattered everywhere but now they found permanent home in Pescador Island since the ban of net fishing (in Pescador). Dive Rate is at P800 ($20) per dive and P1100 ($27) with rental. All dives is inclusive of boat, dm, and air. No minimum divers required as they go out everyday. There are 4 scheduled divers per day that you can join: 9am, 11am, 2pm, 6pm. But they can customize schedule for groups. Cebu Dive Center offers the same rate but I believe they’re 2 of the cheapest. Sevedra is the biggest dive resort with various accommodation types and HUGE dive shop. 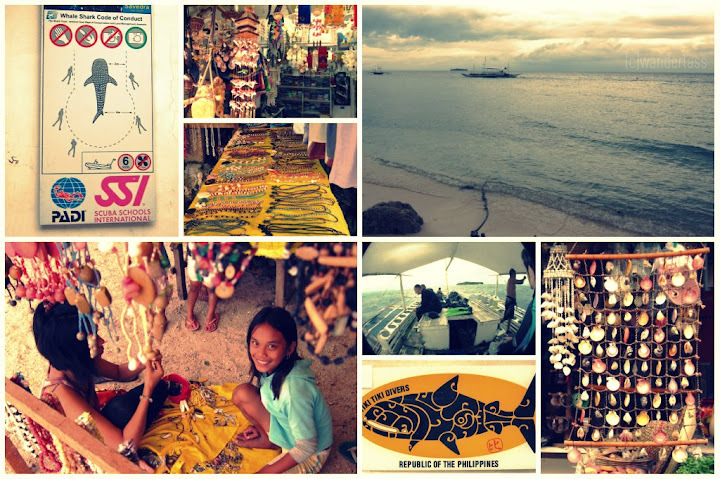 Pescador Island is the main attraction of Moalboal. And to tell the truth, it’s the only site worth diving. For 2 days, I only did a total of 4 dives. I don’t know if because the weather is bad, but there’s absolutely nothing to see on the other sites. We did Sampaguita Point and Dolphin House (no dolphins). They said that night dive at the house reef is interesting with plenty of critters but it was raining a lot at night and very cold when I was there that I got lazy. One of the diver I met called it “our marathon dive” because the DMs just fin away and show us nothing. And to think that all of the divers carry cameras with 2 of them having serious set-up. Wow. That makes me pretty hopeful I’d witness a sardine run myself in June.? I’ve already secured a room in Eve’s. I haven’t booked the dive tour, though. I guess I can just sign up for it when I get there. hi, this is one of the most informative guide ive found. It would be our first time to try diving and we’ll only stay in Moalboal for one day. Do you think that is doable, without having to do a diving course? Nice reading comments here. :) I love the pictures too, and beach there is amazing. Fine sand. Going to Moalboal is quite tiring, but awarding. Once you step on the beach, all of your worries are gone. You forget the busy and noisy life in the city, and all you have there is your own time to relax and enjoy. I recommend to also try going there by scooter or motorbike. It’s convenient and fun. For tourists who would like adventure and going from one place to another with a map and 2-wheels, try renting a motorbike or scooter. There’s a lot in the city, and one is book2wheel.com . Hi. What month did you dive there? I want to see the sardine run. I just don’t know what time of year it peaks. Hi Wanderlass, we enjoy reading about your travels. You should give diving in Moal Boal a second chance though. Other than the sardines (spectacular as that may be), we’ve found the other sites equally enjoyable. Once, we saw over a dozen turtles in a single 50 minute dive and hope to see the thresher at Pescador when we go back. At the beachside resort we stay in, my son has found baby puffers and frog fish along with pipe fish and shrimps that he placed (temporarily) into a fishbowl of the resort before returning these to the sea. We’ve been going back to Moal every other year and it truly does not disappoint. Hi Wanderlass, got really curious about the sardine run in Moalboal. Does it happen only this time of the year? Would really want to see it! i believe they are there the whole year round. what we were hoping to see beside the sardines are the whale shark and thresher which unfortunately are no longer there.